May is National Physical Fitness and Sports Month! Being physically fit encompasses muscular strength and endurance (increases bone growth and fortifies bone density), cardiovascular endurance (exercises the heart) and flexibility (moving joints and muscles through their full range of motion). Spring into action with this cooperative group game that highlights healthy eating, produces endorphins, promotes physical fitness as well as moderate to vigorous physical activity. Be Fit, Be Happy, Be Healthy! 2. “Apples” stand up, leave the circle and scatter in the available space. 5. When the music starts, apples will do an exercise of their choice (jumping jacks, jog in place, touch toes, etc.). 6. “Oranges” will count the number of completed exercises the “apples” do. 8. When the music stops, “oranges” tell the “apples” how many exercises they did, and “bananas” will give the “apples” a high five, pat on the back, round of applause or any other affirmation of their choice. 9. The game continues with the “oranges” exercising, “bananas” counting, and the “apples” cheerleading. When the music stops, the “bananas” tell the “oranges” the total amount of exercises completed, and the “apples” share in the celebrating with the oranges. 10. The game ends after the “bananas” exercise, “apples” count, and “oranges” cheer encouragement. It’s official: This week marked the beginning of summer! Summertime means more time for outside play, and when children go outside they naturally want to move—and not just move, but run and run! Running is a fundamental motor skill that helps children move from one place to another. Once children learn how to crawl, creep and walk, running naturally follows in the developmental order of learning locomotor skills. And when children discover that they can run, they usually can’t get enough of it. Set up boundaries using ropes or the Start to Finish Lines 15’-24’ apart. 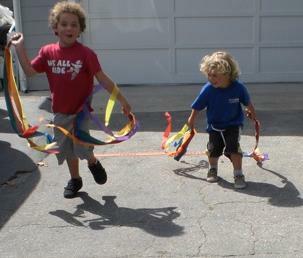 Have children run from one line or boundary to another holding a crepe paper streamer, scarf or Rainbow Dancing Wrist Band. They will automatically return to the start line and ask to do it again and again! Set up boundaries using ropes or the Start to Finish lines 15’-24’ apart. Have children place a paper plates or sheet of newsprint (9” x 12”) or newspaper (11” x 12”) on their chest and start running. As they run faster and faster they will discover that the newspaper or plate will stick to their chest… a lesson in science, too! Another option is to put a paper plates on the palm of each hand and start running to see what happens. Set up boundaries using ropes or the Start to Finish lines 15’-24’ apart. Two people at the finish line hold a sheet of newspaper (~ 22” x 24”) with two hands on each corner. When you say, “Get ready, get set, run,” the child at the “start line” (with the palms of his hands touching and pointing forward) runs and bursts through the newspaper! Set up boundaries using ropes or cones in the available space. Each child tucks a scarf or Rainbow Dancing Wrist Band ribbon into their waistband behind their back. The scarf or ribbon is now their “tail.” The game starts when the music starts and the children run in the available space. 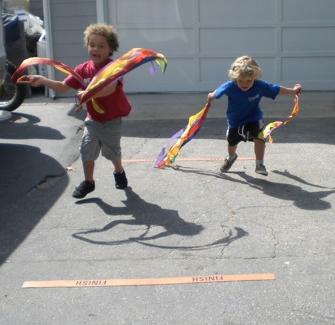 The game is played like tag, but instead of tagging each other, children pull the scarves or ribbons out of others’ waistbands and drop them on the ground. The child whose scarf or ribbon is pulled, picks up his scarf (tail), goes to “the tail repair area” (a designated spot, such as a classroom door, tree, etc.) to replace the scarf in their waistband. Once the scarf is secure in their waistband, the child returns to the game and resumes pulling “tails.” The game ends when the music stops. This group game promotes cooperative play, vigorous physical activity and offers lots of laughter!